A day before the National Development Council (NDC) meets in the national capital, the Planning Commission released the second India Human Development Report (HDR) 2011, which records controversial claims and a few surprises on income, education, health, literacy and sanitation. The last India-specific report had come out in 2000. The report claims that poverty, unemployment and child labour are declining, inter-state disparities are getting narrower and that the improved Human Development Index has been driven by strides made in education. It does concede, however, that the absolute number of the poor (27 per cent according to the report) stood at 302 million compared to 320 million in 1973. Sixty per cent of the poor are still concentrated in Bihar, it holds. The report also claims that “most children, who are still working are doing so as part of their familes’ own enterprise and farms”. It also records a rise in regular and casual wages and a reduction in unemployment. Prepared by the Institute of Applied Manpower Research of the Commission, the report claims that between 2000 and 2007, the Human Development Index rose by 21 per cent, higher than 17 per cent recorded by China during the same period and the 18 per cent estimated by the Global Human Development Report, 2010. The top five slots, states the report, were occupied by Kerala, Delhi, Himachal Pradesh, Goa and Punjab (same as in the last India HDR 2000). 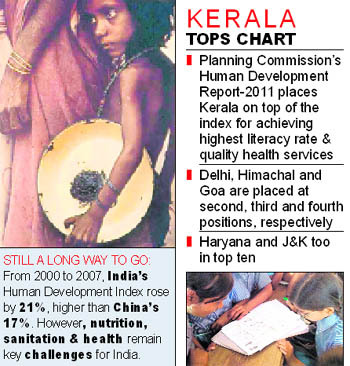 Kerala leads the pack followed by Delhi and Himachal. Haryana slipped two places from 7 to 9 while Jammu and Kashmir and Uttarakhand improved a notch to finish 9th and 14th respectively. For the six lowest HDI states — Bihar, Andhra Pradesh, Chhattisgarh, Madhya Pradesh, Orissa and Assam — HDI improvement has been considerably above the national average. Education (mainly primary level enrollment of 96 pc) is the big gain for India. There has been an improvement of 28.5 per cent in Education Index between 1999 and 2008. Health Index rose by just 13 pc over the period of study. Gujarat fares poorly on hunger index, ranked 13th out of 17. The eight poor states (Bihar, UP, MP, Orissa, Rajasthan, Jharkhand, Uttrakhand, Chhattisgarh) which are home to 48 pc of all SCs, 52 pc of all STs and 44 pc of all Muslims, have posted HDI improvements across groups and states doing well are doing so across board. SCs and OBCs in Delhi, HP, Tamil Nadu and Kerala are better off than upper castes in Bihar and UP in terms of health indicators and Muslims in Andhra are better than Hindus there and better than Hindus in UP, MP, Bihar and Gujarat. Muslims posted the sharpest decline in total fertility rate among all social groups and the highest increase in contraception prevalence rate. Muslims fare better than SCs and STs on other human development indicators. A higher percentage of the minority group has access to toilets too.